Nuts can be a vital part of a weight loss or a health-conscious diet. After years of being shunned by dieters, nuts are now being given a place in their weight loss plan. The many health benefits of nuts make them an important part of a health-conscious diet. While you may have one or two types of nuts you consider favorites, incorporating mixed nuts into your diet is an excellent way to diversify your culinary experiences and benefit from the various nutritional benefits different types of nuts provide. The simplest way to enjoy raw mixed nuts is to make them one of your regular go-to snacks. A handful of raw mixed nuts can quickly satisfy hunger pangs any time of day. Mixed nuts have a lot to offer. When you focus on one type of nut as a snack item, you’re getting the nutritional benefits that nut provides. The percentage of fiber, fat, protein, carbohydrates various in each type of nut. The creamy-textured cashew has a lower fat content than most types of nuts. Almonds are a complete source of energy. Hazelnuts are high in fiber, folate and vitamin E. The pecans you’re enjoying in your mixed nut assortment are beneficial to your heart health and are a good source of the B-complex vitamins. By enjoying a handful of raw mixed nuts or roasted mixed nuts for a snack, you’ll be getting an excellent combination of nutritional benefits. By making raw mixed nuts a pantry staple, you will always have a versatile recipe ingredient on hand. You can let your culinary creativity run rampant with flavor combinations you create to make your own versions of spicy roasted nuts. If you like to spend your free time somewhere other than the kitchen, you can simply keep a supply of roasted mixed nuts in your pantry to enjoy at home or on-the-go. Mixed nuts can be purchased salted or unsalted. 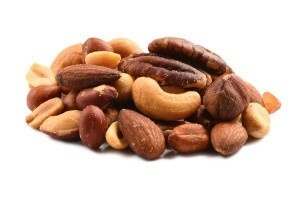 If you’re on a diet that restricts your sodium intake, unsalted mixed nuts would be best for you. If you create homemade snack mixes, using unsalted mixed nuts allows you to control the amount of sodium in the mix. Using unsalted mixed nuts in recipes such as spicy mixed nuts, seasoned mixed nuts or dark chocolate mixed nuts assures that the dish will be flavorful but not overly salty. Salted mixed nuts are an exceptionally flavorful snack. They’re also delicious when used to create delectable desserts such as salted nut bars or salted nut cookies. Buying the best mixed nuts will elevate the overall quality of any recipe. It’s easier to remain dedicated to any type of diet if you enjoy the foods you’re eating. Mixed nuts can be a fun snack for kids and adults. It’s fun to experience the diversity of flavor and textures in a handful of mixed nuts. Kids and adults sometimes like to eat one type of nut at a time from their mixed nut assortment. They enjoy the fun of knowing a new flavor experience occurs each time they switch to a different type of nut.